Touching down into Colombo, Sri Lanka, this question abruptly surfaced in my mind. I had just spent a wonderful year working as a neurologist in sunny Cairns, Australia, with a superb group of patients, colleagues, and co-workers. Now, I was touching down into an unfamiliar country, a place that I had picked out on the map as the starting point for this next journey for little reason other than that I knew virtually nothing about it. What prompted this? It was not clear to me at the time, although I did know that despite my success in freeing my mind from its external chains during Sojourn, a deeper and more internalized enemy now remained. If all anguish emerges from a craving for life to be other than it is, then I now had to free my mind from the internal chains that were muddying my clarity of vision. To this end, I had once again donated or gave away the few possessions that had built up over the previous year, left what remained with a good friend, and headed down the road of uncertainty - to quote a certain film, a free man at the start of a long journey whose conclusion is uncertain...this is Vigil. Thankfully, that initial question faded into nothingness within the first couple of hours of arriving in Colombo. As I left the airport to catch a taxi, the distinctive sounds of numerous rickshaws or "tuk-tuks" zipping down the road in race-like formation pervaded my senses, reminding me of some time that I had spent ten years earlier in India. However, as my taxi glided towards my accommodation, I noted that the traffic in Colombo was only half as chaotic as the cities I had visited in India, and at rare times dare I say it, even relaxing. With a metropolitan population of 4.6 million people, Colombo is by far the largest city in Sri Lanka. The name "Colombo" was introduced in 1505 by the Portuguese, although it is believed to be derived from a classical Sinhalese name; the Sinhalese people make up the largest ethnic group in Sri Lanka, constituting sixteen million of the country's 20.2 million people. 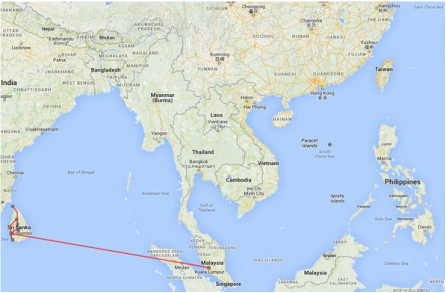 The Portuguese held onto Colombo until it was taken by the Dutch in 1656, who in turn lost it to the British in 1796. With its natural harbour, Colombo has always been important as a centre of trade between the Sinhalese kingdoms and the outside world. I arrived at the hostel that I had booked a couple of days earlier, The Clock Inn; indeed, it was full of clocks of all sizes and descriptions, including a rather large one built into the front of the reception counter. The mean age of the staff in the hostel must have been under 20 years of age; basically, it was run by a group of extremely cheery and helpful young Sri Lankan fellows who stopped at nothing to help their guests in any way possible. All questions and quandaries were greeted with a smile, a shake of the head, and a thrifty solution. As I was tired, I grabbed a great meal at a nearby restaurant, the Green Terrace Cafe, for the price of 300 Sri Lankan rupees (about two US dollars); fantastic food at bargain prices was to become the norm over the ensuing weeks. Heading out for an afternoon stroll, I tried to let my mind settle down and was immediately struck by the amiability of several Sri Lankans that approached me. Over the course of two hours, I was offered assistance with directions no less than three times by several friendly people. After a much-needed night of sleep, I woke up, scarfed down an omelette made by the cheerful hostel staff, and prepared my usual breakfast staple of butter coffee (a quarter slab of butter in coffee; delicious) using a steel plunger that I had bought exclusively for this trip. The butter coffee usually invites questions from other travellers, and I made polite conversation with some of them. Walking back to my room, I was greeted by a wide smile from one of the other guests, a young lady named Ceylan. She was from Turkey, but had been studying in India for several months at an ashram, or spiritual monastery; she was only in Sri Lanka for a few more days, waiting for a visa that would get her back to India. Ceylan was a genuinely kind and free spirit, a person free from ulterior motives. We chatted briefly and as it turned out, we both had plans to visit the Gangarayama Temple that day; a joint venture simply made sense. The day turned out to be hot and humid, and after strolling around the city for a bit we arrived at Gangarayama Temple quasi-drenched with perspiration. The temple is one of many across Sri Lanka dedicated to Siddhartha Gautama, also know as the Buddha or "Awakened One", the man on whom the teachings of Buddhism were founded. 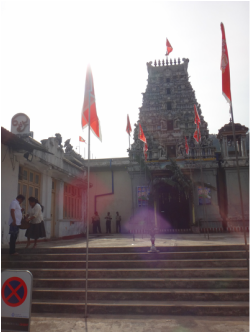 Deemed to be one of the more important temples in Colombo, Gangarayama Temple boasts a combination of Sri Lankan, Thai, Indian, and Chinese architecture, and contains several large Buddha statues as well as a multitude of smaller Buddha statues in different poses and positions. Ceylan and I took our time exploring the temple, and the experience was serene. Afterwards, we wandered over to an outdoor restaurant by the ocean and ordered several king coconuts, a type of coconut from Sri Lanka that is consumed in the thousands on a daily basis. A party of free-loading squirrels constantly begged us to share some of our food. While drinking coconut juice, a sudden and ferocious thunderstorm erupted, forcing us to stay put for several hours. Despite the storm, we were still treated to a radiant sunset, and the storm relinquished its anger after a couple of hours. The following day we made an impromptu train journey to Galle, an old fortified city built by the Portuguese and Dutch located two hours south of Colombo by train. For the train journey, we could choose either first, second, or third class; from what I had been told, first class had air conditioning, second class had fans, and third class had neither. We travelled only second class that day, which I can indeed confirm contains fans. It was quite comfortable. We spent most of our time in Galle sipping coffee at an out-of-the-way place surrounded by monitor lizards and monkeys while yet another thunderstorm raged around us. In the evening we had a great meal at a small bar seething with reggae music, with a bartender that looked like a young version of Bob Marley. As I was still easing out of work mode - and I find that it takes at least two full weeks of relaxation to do so - I spent my remaining days in Colombo taking it easy. Ceylan and I met a self-made man named Ray from the US. Ray had been trained as an engineer in Boston, but had cast off his previous life for a more active lifestyle consisting of constant travel, which he funded by teaching English over the internet to people all over Asia. I was interested to hear that upon quitting his engineering job, several well-meaning friends had warned him that it might be a mistake, but upon realizing Ray's good fortunes now, those same people now applauded him for the decision that they had questioned or criticized earlier. In Ray's tired own words, "So now I'm the genius." The three of us - Ray, Ceylan, and myself - had several escapades around Colombo. Perhaps the most memorable of these was a day spent at a beautiful stretch of beach in Mount Lavinia, an area to the south of the city. We arrived in the morning and spent much of the day occupying ourselves with refreshing swims, lively debates, and more than a few good laughs. Ceylan took me to a sublime restaurant in one of Colombo's gardens that night, where we had a fantastic buffet meal accompanied by, of course, another howling thunderstorm. Life being impermanent, however, Colombo could not last forever. Ceylan was to return to her ashram, and I was to explore other areas of Sri Lanka. The three of us had a nice final dinner together as the sun set over the Indian Ocean. The following morning, I boarded a bus bound for the little town of Miskeliya, located in the middle of Sri Lanka. 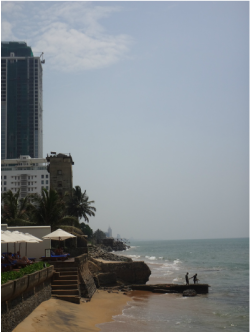 Colombo, Sri Lanka's largest city, is nestled beside the Indian Ocean. Some fellows with cricket fever playing in the street. My first rickshaw or "tuk-tuk" ride in ten years...can't wait. Bit of garbage in those waterways; these guys are trying to fish it out. One of the large Buddha statues of Gangarayama Temple. Ceylan is surprised to find an elephant inside the temple. Numerous Buddha statues adorn Gangarayama Temple, showing him in different poses. Ceylan and I delight in our king coconuts. The beach in Mount Lavinia, the tall buildings of Colombo in the distance. Me, Ceylan, and Ray enjoying a relaxing day at Mount Lavinia. Ray gets ready to hit the Lion Lager, a popular and tasty Sri Lankan beer. I had been warned several times not to travel in Sri Lanka by bus; when I pressed the hostel staff and other travellers who gave me this advice, they simply stated that the buses were crowded, dirty, and slow. Trains were the recommended mode of travel or, even better, hiring a car with a driver for a few days. Fatefully, the trains to Miskeliya were all sold out for a couple of days, and since I had no interest in hiring a driver, the only remaining option was to take the bus, which turned out to be a repeatedly great experience over the next couple of weeks. Upon leaving the hostel in the morning, I asked one of the staff how long it would take to get to Miskeliya by bus, and I was told seven hours. At the bus station, I repeated this question at the information counter and was told five hours. As I boarded the bus, I asked the fellow beside me how long it took to get to Miskeliya, and he stated that it was just over three hours. This was great! Miskeliya seemed to be getting closer with each person I asked. At any rate, the actual travel time was just over three hours, so the last fellow - probably the only one that had actually taken that bus before - was correct. I was the only foreigner on the bus, and people were friendly. A couple of people politely asked why I was taking the bus and not the train, and laughed when I said how I could not get on the train. Everyone was nice, without exception. At one point, I gave up my seat for an elderly man; this seemed to surprise several people, and another guy about my age as well as a little girl about ten years old then offered their own seats to me; I declined, as there were still other people who needed them more. After passing through a great many tea plantations, I arrived in Miskeliya, hefted my backpack, and started walking towards my destination, a pleasant place called Madusha Rest about a kilometer outside of town. Madusha Rest turned out to be a special place. Owned by a talkative yet humble fellow named Hemantha, it is quaint, quiet, and surrounded by peaceful mountain scenery; in other words, the perfect place to unwind. There were only two other guests staying there, Lucas and Theresa, a couple from the Czech Republic. We trekked together up to a lookout over a lake to gaze upon the sun as it lowered itself behind a mountain called Sri Pada, or Adam's Peak. At an elevation of 2,243 meters (7,359 feet), Adam's Peak decidedly towers above the surrounding mountains. The mountain is sacred to not only Buddhists but also Hindus, Muslims, and Christians as a result of an indentation in the rock at the summit that resembles a footprint considered to be that of the Buddha by Buddhists, Shiva by Hindus, and Adam by Christians. Thousands of people make the seven kilometer climb to the top every year, and I was interested in doing so myself. Lucas, Theresa, and I decided to start the climb to Adam's Peak at 2 am so as to witness the sunrise from the summit. Hemantha fed us dinner and arranged for a tuk-tuk to pick us up at that time; it was surprising how cold the night was compared to the day, but I reminded myself that I was now in the mountains and no longer on a beach. After a twenty minute ride, our driver dropped us off at the climb's entrance and we started our ascent. Much of the climb to Adam's Peak was pretty touristy, even in the wee hours of the morning; shop after shop lined the side of the path up the mountain selling all kinds of wares imaginable. One such shop was selling inflatable pool toys, although I'm pretty sure that there were no pools nearby. For the first several kilometers, I was able to maintain a good pace, but during the latter half of the trek, the stairs became narrow in large sections and bottlenecks occurred as the slower trekkers held things up a bit for everyone else. I must admit that I was initially a bit irritated at being slowed down, but I somehow became aware that the point of this climb was not to do it quickly or efficiently, but to climb it with a kind of respect for the mountain and the people who revered it; upon realizing this, I relaxed and enjoyed the slow pace. I also took a couple of opportunities to stop and drink some delicious tea from one of the many tea houses along the way. Upon reaching the summit at around 5 am, I found a small space along a crowded wall and patiently waited for the sunrise. As the sky reddened and the first rays peeked over the horizon, a sunrise ceremony was performed to the music of loud drums and the eerie gyaling, an oboe-like woodwind instrument associated with peaceful deities and the idea of devotion. After spending a couple of hours on the summit, I meandered back down, finding Lucas and Theresa along the way, and the three of us returned back to Madusha Rest just before noon. Having trekked most of the night, we had a good sleep and Hemantha treated us to a comprehensive Sri Lankan dinner that night, along with a bit of resplendent storytelling. The following day was a reflective one, as I became immersed in the peace and tranquility of Hemantha's little paradise that he calls home. As I was readying my departure, he kindly placed his hand over his heart and said to me, "You are in here always." Heading north to the city of Kandy by bus the day after, I was again overwhelmed by the generosity of the people that I met. I had been chatting a bit with the lady beside me, asking about her family and the other usual things of interest. As the ticket master came by, she gave him some money, and he continued past me. When I tried to get his attention, she said not to worry about it; she had actually paid for my ticket! Up until this point I had never in my life had my fare paid by a complete stranger on a bus or any other mode of transportation before; I found it quite amazing that somebody I had barely known for ten minutes had done so. Arriving in Kandy, I checked into the Kandy Down Town Hostel and walked into and around the city. Although much smaller than Colombo at only 125,000 people, Kandy is still one of the largest cities in Sri Lanka. It is surrounded by tea plantations, and it contains the Temple of the Tooth, one of the most sacred sites for Buddhist worship in the world. I passed by the Temple of the Tooth, but decided to focus on the city itself, particularly the fine cuisine. I was pretty hungry after the bus ride, and ordered four servings of food at one restaurant which amused the guy behind the counter. After wandering around Kandy's markets and purchasing some small items, I returned to the hostel to spend a rather social evening with the other nice people staying there, particularly an introspective permanent traveller named Pius from the US. The best things about Kandy are arguably not in the city itself, but around it, so I hired a tuk-tuk the following day to explore outside of Kandy. The driver, Indika, was a polite and easygoing chap. We initially went by the Pinnawala elephant orphanage, where I had a chance to follow a herd of elephants as they were led to a river and watch them for some time in the water. Indika then took me to a local tea factory and plantation; after learning about how the leaves are processed to create tea, I was surprised to learn that tiny Sri Lanka is the world's largest tea exporter (though not the top producer). After sipping some fine Broken Orange Pekoe Tea, I asked Indika to take us to a restaurant of his choice so that I could buy some lunch for us. It is difficult to judge the quality of food that a Sri Lankan restaurant serves based on the appearance of the restaurant itself, and the place where we had lunch was no exception - on the outside, all I saw was a rather dingy-looking two-story building; on the inside, a splendid buffet-style meal. We ate like kings. After lunch, Indika dropped me off at the Royal Botanical Gardens just outside of Kandy, where I had a thoughtful stroll and a brief rest. I spent the next day resting in the Kandy Down Town hostel having several engaging discussions with Rob from Sweden, an honest and contemplative fellow with many astute observations and life experiences. In the evening, I was yet again subjected to Sri Lankan kindness. The hostel manager, Hanti, stated to me matter-of-factly, "Good evening sir, I am making you dinner tonight." I was not allowed to pay for the meal, of course. By this point, I realized that travelling by bus was allowing me to interact with local Sri Lankans to a greater extent than if I were taking the train or hiring a car, so I decided to keep a good thing going, got on another bus, and headed north to the city of Dambulla the following day. Madusha Rest, probably the best place I stayed at in Sri Lanka. I passed by this young fellow on the way to the lake to view Adam's Peak; he gave me a "thumbs up" after I took this photo. A view of Adam's Peak as the sun sets, from below. 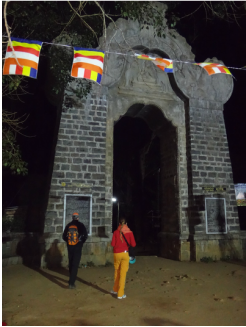 Lucas and Theresa at the start of the Adam's Peak ascent; it's 3 am. Summit of Adam's Peak, where people are giving their respects; it's 5 am. Summit of Adam's Peak during a sunrise ceremony; it's nearly 7 am. That is not an actual mountain in the distance, rather the shadow of Adam's Peak; the photo was taken from the peak itself as the sun rises. Monks descending from Adam's Peak. The Temple of the Tooth in Kandy is one of the most important Buddhist sites in the world. Elephants enjoying the river at Pinnawala elephant orphanage. The herder and the elephants contemplate their mutual frustrations. 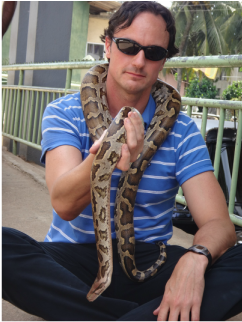 There are other animals at Pinnawala, like this python; I was also allowed to hold a feisty cobra. Indika seems a bit lost amongst the tea plants. A nice stroll in the Royal Botanical Gardens. The bus to Dambulla was uneventful; the familiar sights of houses, mountains, and tea plants passed by through the window like a silent film. Upon arriving at the Dambulla City Hostel, run by the calm and amiable Steven, I met a lone traveller, Stefan from Switzerland. Stefan had a different way of thinking, arising from his critical insights into his own motives and country of origin, and I enjoyed his company for the next couple of days. That same afternoon, we ambled through the streets of the city to see the Dambulla Cave Temple, the largest cave temple complex in Sri Lanka. The site consists of five caves under a huge overhanging rock; collectively, they contain 153 statues of the Buddha and his life, as well as a number of paintings. The complex is really old, dating back to the 3rd century BC. The heat was sweltering outside and so it was nice to get into the caves and gaze at a few more statues of the Buddha while swallowed by the cool darkness. As Stefan and I relaxed in the hostel that evening, another traveller arrived late that night, Yu from Taiwan. She had just flown in that day and so she was a bit tired, but nonetheless was keen to join us for an early morning the following day to explore the ancient palace of Sigiriya, the most visited historic site in all of Sri Lanka. Sigiriya was built on top of a massive rock 200 meters (660 feet) high by King Kashyapa in 477 AD who had seized the throne from his father, King Dhatusena. Kashyapa was Dhatusena's son by a non-royal consort, and when he seized power he constructed Sigiriya both as his capital city as well as a fortress designed to withstand any attack. About halfway up the rock Kashyapa built a gateway in the form of an enormous lion from which the whole site derives its name - Sihagiri, the Lion Rock. Unfortunately for Kashyapa, the rightful heir Moggallana defeated him in 495 AD, after which Moggallana moved the capital back to Anuradhapura. He converted Sigiriya into a Buddhist monastery and it remained that way for nearly a thousand years. Walking towards Sigiriya, we were rewarded with an impressive view as the rock loomed overhead, obliterating the sun with its massive presence. Since we had started so early in the morning, there were only a handful of other people at the site and the early morning temperature was cool. We took our time, pausing to take many pictures along the way, and spent a couple hours at the top just taking in the magnificent views. Sigiriya is one of those sites that really does live up to any standards; it is well worth the effort to make the trip to experience it. After Sigiriya, our tuk-tuk driver for the day, Bandara, insisted on taking us to some additional attractions including a spice garden and a precious stones store, after which I pulled my previous trick of offering to buy us lunch if he took us to a place where he himself would normally eat. Once again, we were not disappointed with the all-you-can-eat Sri Lankan restaurant that he shuttled us to; the bill came to 900 rupees (about seven US dollars) for all four of us. Talk about value for money! Thus satisfied, I departed for the northern city of Anuradhapura the next morning. I was looking forward to a bit of solo time. I arrived at my accommodation, The Charm Inn, and met the fellow running the show; his name was Shelton. After getting trounced by Shelton in a game of carrom, an eastern table game with some similarities to billiards, I retired to bed. Anuradhapura is relatively small at 63,000 people, but it exudes a significant presence as it was the capital city of Sri Lanka for an incredibly long period of time, from the 4th century BC to the 11th century AD. It is one of the oldest continuously inhabited cities in the world and contains a number of fascinating structures called stupas, the largest brick structures known to the pre-modern world. Stupas were constructed as hemispherical domes with a spire in the middle, and their main purpose was to enshrine relics of the Buddha. As I was unable to find a map, I decided to try and walk around the ancient section of Anuradhapura relying only on the directions of strangers. This was a good decision as it proved to make the day more interesting. It was several kilometers from The Charm Inn to the ancient section. As I walked through crowded Anuradhapura and eventually into far less crowded fields of rice paddies, I received more than the usual number of stares. I should mention that being stared at is a common occurrence for some foreigners in Sri Lanka, and in my experience the stares simply reflect curiosity; I would usually smile and wave in response and the stare would virtually always turn into a wide smile in return. That I was receiving more stares now probably meant that the people outside of town were not as used to seeing an obvious foreigner walking along the small highways instead of sitting in the back of a tuk-tuk, I reckoned. Whatever the reason, an elderly lady walking along the road in front of me turned around after hearing me refuse the hundredth offer that day for a ride from one of the many tuk-tuk drivers, and started chatting to me. She introduced herself as Amala, and it was obvious she had just been out shopping for rice. We had a brief conversation, and after only five minutes Amala generously invited me into her home for a rest and a coffee. I accepted her kind offer, as it was pretty hot out and I had already been walking a few kilometers. Her house was basic but colourful, and decorated with numerous pictures dedicated to the Buddha. After that brief oasis, I thanked her for the coffee and pressed on. Following a bit of asking around, I eventually made it to the ancient section of the city. I visited Jetavanarayama Stupa first, the tallest stupa - and therefore brick structure - in the ancient world. Jetavanarayama has a height of 122 meters (400 feet), and a ridiculous 93 million baked bricks were used in its construction. It is believed that Jetavanarayama houses a part of the sash or belt tied by the Buddha. I walked the perimeter of the stupa. Seeing another tall structure in the distance, I next made my way over to Ruwanwelisaya Stupa, a white stupa considered a marvel for its architectural qualities that is sacred to Buddhists the world over. It is believed to contain a number of ancient relics relating to the Buddha. I sat at Ruwanwelisaya for a couple of hours, lost in thought, or perhaps the absence of thought - I'm not sure which, maybe both. There were a few people, but it wasn't too crowded. At one point a large Sri Lankan family passed by with their little son. Their son was staring at me, so I waved, whereupon every single member of the family, including the grandmother, proceeded to stand beside me for a photo shoot; it was fun, but after a dozen or so photos I was glad to return to my peaceful reverie. I left Ruwanwelisaya, turned right although I had no idea where I was going, and enjoyed more of the ancient section of Anuradhapura. At one point an old man approached me, handed me a candle, and asked that I light it and place it in a shrine surrounded by incense. He said it would bring me luck. Upon doing so, we spoke briefly - the usual questions such as where are you from and why are you travelling alone - to which I gave the usual pre-recorded answers. He then caught me off-guard with a simple statement amidst the questions. "You are Buddhist, sir!" exclaimed the old man. "I am not sure what I am," came the distant reply. I ambled on, but hunger set in as it was now closing in on 2 pm, so I set out to walk back to the new section of the city. I was assailed by yet another tuk-tuk driver, but this guy seemed different - perhaps it was his smile, yes that was it, the smile was genuine - and so I decided to take him up on his offer. He asked for 150 rupees, which I knew to actually be less than what most tuk-tuk drivers would ask for, so I countered and said I would be happy to pay him 200 rupees; that's less than two US dollars by the way, so no great generosity on my part. The driver's name was Amara, a man with a somewhat sad story that I will not dwell on here; I enjoyed his company so much that after lunch I accepted his offer to take me up to the sacred mountain of Mihintale. Mihintale is special in Sri Lanka, believed to be the meeting place between the Buddhist monk Mahinda and King Devanampiyatissa, a meeting that heralded the presence of Buddhism in Sri Lanka. It is now a pilgrimage site and contains several ancient structures including the Kaludiya Pokuna (a site still inhabited by Buddhist monks that contains a large pond with water that appears pitch black due to the reflection from the surrounding boulders), an enormous Buddha statue (of course), the Maha Stupa (a picturesque stupa on the summit of the Mihintale hill), and the Aradhana Gala (a huge rock that provides a high and windy vantage point). I spent several hours at Mihintale, enough time to catch the sunset. Aside from the dogs and monkeys, it was not crowded at all. Anuradhapura is arguably the heart and soul of Sri Lanka. It was a privilege to experience it. It was time to head to the extreme north of the country, for something different. The Dambulla Cave Temple is a complex of five caves lying under an overhanging rock. On the inside, there are a whole lot of Buddha statues. Stefan marches towards Sigiriya, an ancient palace perched on top of a massive rock. Yu snaps a photo from about two-thirds of the way up the rock of Sigiriya. Plenty of space on the top at this time of the day. A different view of Sigiriya from below. Stefan, Bandara, and Yu delight in a fine Sri Lankan meal; total price for four people all you can eat, 900 rupees (about seven US dollars). Anuradhapura, new section; lots of people. Anuradhapura, ancient section; lots of monkeys. The red-coloured Jetavanarayama Stupa is the largest brick structure in the ancient world. The white-coloured Ruwanwelisaya Stupa is revered by Buddhists all over the world. The water of the pond of the Kaludiya Pokuna is pitch black as a result of reflections from the surrounding boulders. Several steps must be climbed to reach the top of Mihintale hill. You can see a couple of people halfway up. The view is virtually always worth the climb, as this monkey will attest to (though he probably never did the climb). Another monkey (bottom left corner) watches over the large Buddha statue on Mihintale hill. The Maha Stupa at sunset. I travelled by train to Jaffna. It was half-empty, with lots of space. As we rolled north the hills gave way to flat plains and marshland, terrain I had not yet seen in Sri Lanka. Upon leaving the Jaffna train station, I was set upon by several different potential tuk-tuk drivers, asking me where I wanted to go. I politely refused their offers and walked by, having learned years ago that you never, ever take a ride with anyone that approaches you at a bus station, train station, or airport, unless you want to be overcharged. In the midst of my refusals, I noticed a fellow standing silently beside his tuk-tuk across the parking lot; that was the right guy to ride with. The fee was reasonable, and we were off to the Treateroo Hostel. I met a couple of nice people there, namely Maia from Australia and Fabian from Austria. Jaffna is a moderately large city of 88,000 people. In many ways, it is the odd man out in Sri Lanka. For starters, most of the people in Jaffna are Sri Lankan Tamils, most of whom are Hindu, whereas most of the people in the rest of the country are Sinhalese, most of whom are Buddhists. Partly as a result of these differences, Jaffna was also involved for decades in a long civil war. After gaining independence from Britain in 1948, relations between the Sri Lankan Tamils and the Sinhalese deteriorated culminating in the start of the Sri Lankan Civil War in 1983. This conflict pitted the Liberation Tigers of Tamil Eelam (LTTE, also called the Tamil Tigers) against the Sri Lankan military and resulted in the loss of nearly 100,000 people. Jaffna suffered particularly badly; prior to the war it was the second largest city in Sri Lanka, but it has fallen down the list since then. The Sri Lankan Civil War raged on for 25 years until the Tamil Tigers were finally definitively defeated in 2009. Fabian joined me for a day of sightseeing by foot. I was immediately struck by the many cows walking around Jaffna, reminiscent of India, as well as the war-torn appearance of the city, with many of the buildings not only abandoned, but still in ruins from the war. We checked out the most significant Hindu temple in the city, Nallur Kandaswamy Kovil, founded in 948 AD. The temple itself was huge, with many halls and statues of various deities. A lone believer sang a mysterious mantra chant in one of the corners; a mantra is a sacred sound, word, or group of words believed to contain psychological or spiritual power. The haunting sounds of his mantra filled every corner of the temple. We also explored the Jaffna Fort, built by the Portuguese in 1618 but taken over later on by the Dutch and then the British. The entire structure had been well preserved for centuries, but during the Sri Lankan Civil War the fort suffered severe damage, being the scene of several pitched battles. Much of the wall remains intact, but in many places the wall and the buildings that were inside it have been comprehensively reduced to rubble. Clearly, Jaffna suffered extensively from the civil war, and even now - six years later - it has only just begun to recover. After Jaffna, I returned to Colombo by train, and of course, the fellow sitting beside me bought me lunch. I stayed in Colombo for two more days before leaving the country. This old lady pauses from her work in the fields to scrutinize the train as it approaches Jaffna. Plenty of cows in Jaffna, even close to the centre of the city. Fabian glances up at one of the many abandoned buildings lining the city streets. Nallur Kandaswamy Kovil, one of the most significant Hindu temples in Sri Lanka. Goats rummage around inside the Jaffna Fort. Sri Lanka is the kindest country I have ever visited. I did not experience a single negative interaction. In the space of three weeks, a complete stranger paid for my bus fare, another one invited me into her home for coffee, and another bought me lunch, to cite only a few examples. I do not know if acts of kindness such as these are the norm or the exception in Sri Lanka, but either way, what a wonderful experience.